SPIDA Software, the industry leader in structural analysis and asset management software for utilities and their contractors, has announced the availability of SPIDAcalc – v7.0 Jumper software. The next generation of SPIDAcalc showcases an all-new user interface and extensive new features, designed to vastly improve overall customer usability and increase productivity. The development of SPIDAcalc Jumper focused heavily on improving user experience and making the software more intuitive. Inspired by feedback gained from existing clients, SPIDAcalc boasts a configurable layout, allowing users to tailor the software to their individual needs. With leadership roots in both the engineering and utility industries, SPIDA Software took a unique approach to the development of SPIDAcalc Jumper. In addition to the complete user interface redesign, SPIDA’s engineering team developed new features designed to tackle the complex challenges of utility life. SPIDAcalc Jumper introduces lead and wire connectivity to the pole loading community, shattering an industry norm by eliminating the repetitive modeling of individual structures. A connected environment provides greater efficiency by allowing users to create, add, and modify an entire pole line with just a few clicks of the mouse. SPIDAcalc Jumper is the first-ever structural analysis software to incorporate a cloud-based analysis option. Aimed at increasing productivity, this new analysis option allows users to send designs to the cloud instead of running them locally. Tailored for those users analyzing larger projects or using SPIDAcalc’s robust geometric nonlinear analysis methods, cloud-based analysis drastically reduces the time it takes to analyze a project and lets users continue working in SPIDAcalc while analysis is being performed. Online analysis offers the scalable horsepower to handle the analysis of 1 pole or 100,000 poles in a matter of minutes. SPIDA Software recognizes that a utility’s success is measured by reducing time spent on projects and increasing productivity. Aging infrastructure, increase regulatory oversight, the explosion of broadband deployments, and limited personnel resources have forced utilities to reevaluate current processes and look for innovative solutions. SPIDAcalc Jumper empowers utility organizations and their contractors to be more effective and efficient in their pole loading analysis. To obtain a copy of the official SPIDAcalc – v7.0 Jumper release notes, please contact our Support Team by visiting the SPIDA website at http://www.spidasoftware.com/contact. 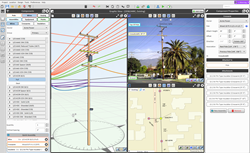 Serving electric and telecommunication utilities since 2007, SPIDA Software’s cost-effective Structure Management System is a unique platform developed to encourage users to go beyond pole loading. The SMS platform includes SPIDAcalc, the industry’s leading structural analysis software, and SPIDAstudio, the first-ever scalable, on-demand platform for the oversight of activity, analysis, and management of asset structural health. SPIDA Software’s solutions are developed and supported by a knowledgeable, passionate staff with extensive industry experience.